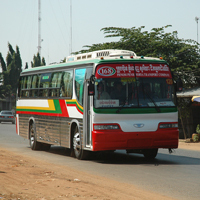 Buses are the preferred form of inter-provincial transportation in Cambodia. All of the national routes are ordinarily in good condition though there is construction in some areas. Regularly scheduled a/c buses run between most major cities, with Phnom Penh serving as the country's transportation hub. More than a dozen bus companies offer regularly scheduled buses from Phnom Penh to all major towns as well as Ho Chi Minh City and Bangkok. There are also night buses between the most popular tourist destinations, though for safety reasons, we do not recommend them. You get what you pay for on Cambodian buses. All are a/c and fairly comfortable, but the cheaper buses are often older, make extra stops and have other small inconveniences. Deluxe buses offering a higher standard of service, safety and comfort have become popular with companies such as Mekong Express and Giant Ibis running buses Phnom Penh to Siem Reap, Sihanoukville, Kampot and HCMC. 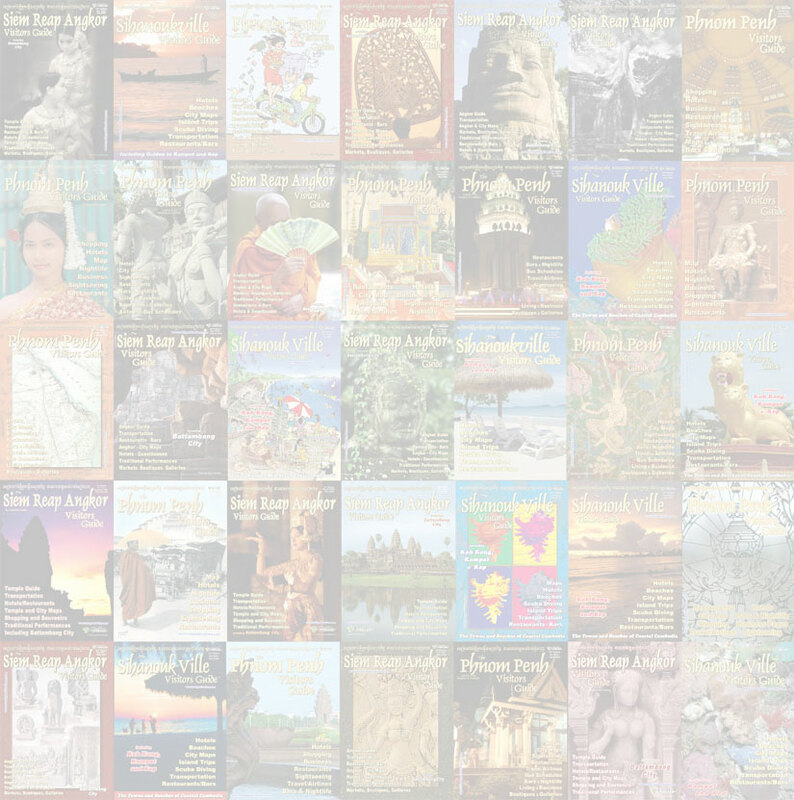 Some companies, especially in Siem Reap and Sihanoukville, offer free hotel pick-up. If you are connecting with a plane in Phnom Penh allow at least an hour to get to the airport from the station. 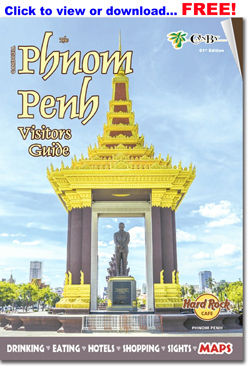 Cambodia's National Highways radiate out from the centrally located capital city of Phnom Penh like spokes from a hub, and as such Phnom Penh serves as a hub for bus travel in Cambodia, with buses departing Phnom Penh for almost all provincial capitals and major cities. Most major cities have a central bus station, though not Phnom Penh. Buses from different companies depart from different stations and offices around town though several are clustered into a couple of areas (such as 4 or 5 companies on the riverfront at Street 106, and another group of Vietnam bound bus companies on Sihanouk Blvd near Olympic Stadium.) Some buses depart/arrive from the bus company office, others from remote bus stands such as market parking lots. See bus stations below. A few companies offer free hotel pick-up. Distance, road and duration: National Route #6A and #6, 314 km, 6-7hrs. Road conditions: The roads are in very good condition, except for short stretches of road repair. Transport notes: There are dozens of daily buses and vans in both directions. Cheapest, the standard buses and vans provide A/C and sometimes on-board toilet, but are generally fairly basic and local. A few companies including the popular Giant Ibis run deluxe buses and mini-buses offering a better level of service, safety and comfort. The deluxe buses tend to take a bit longer, but that is for safety reasons as they drive a bit more slowly and carefully. Night buses are available, but we do not recommend them due to poor nigh time road conditions. If you must take a night bus we strongly recommend taking a deluxe bus. The buses ordinarily stop at a restaurant in Kampong Thom (about 2-3 hours from Siem Reap) for a 30-40 minute rest break. Bus stations: In Siem Reap, most buses arrive and depart from the Chong Kao Sou bus station near Phsar Leu, 7km from town center. Distance, road and duration: 230km, 4hrs, National Route #4. Bus stations: In Sihanoukville, all buses arrive/ depart from the Public Bus Station. Transport notes: The standard buses are cheapest, providing full size A/C buses, but are generally fairly basic and local. Two companies including the popular Giant Ibis run deluxe mini-buses offering a better level of service, safety and comfort. The deluxe buses tend to take a bit longer, but that is for safety reasons as they drive a bit more slowly and carefully. Night buses are available, but we do not recommend them due to poor nigh time road conditions. The bus will ordinarily make a 20-30 minute rest stop at a restaurant near the half way point around Pich Nil Mountain Pass. Distance, road and duration: National Route #3 (to Kampot), 148km, 3hrs. Three or four bus companies run daily buses from Phnom Penh to Kampot, one combining the destinations of Kampot and Kep. The Phnom Penh Sorya bus to/from Kep loops though both Kampot and Kep (which are about 30 minutes apart) - Kep first on the way from Phnom Penh and Kep second on the way to Phnom Penh. Bus Stations: In Kampot, the main bus station is located at the end of old market road, 500m from the riverfront. In Kep the bus station is located at the Kep Beach intersection. Distance, road and duration: National Route #4 (NR4) and Road #48 runs between NR4 and Koh Kong City. Road condition: The road from Koh Kong (Road #48) is back in good condition - fully paved but with several short broken sections of potholes and road damage. Three companies offer daily a/c bus service between Koh Kong, Phnom Penh and Sihanoukville. Bus Stations: In Koh Kong the bus offices are located on Street 3 in the center of town. The bus station is on Street 4 at the north end of town about a half kilometer from downtown. Road conditions: Mostly good condition, with some short areas of construction. Transport notes: Several bus companies (including Mekong Express, Phnom Penh Sorya, Bayon VIP and more...) run multiple daily buses between Phnom Penh to Battambang. Buses depart hourly or so, first bus departs at 4:00AM and the last at 17:30PM. Bus Stations: In Battambang, buses depart from the various transportation company offices. Transport Notes: This is the border city on the Cambodian side of the Thai border. 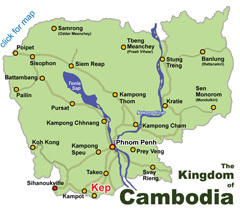 Casinos are located on the border on the far side of the immigration checkpoint, on the Cambodian side of the border. You do not need to exit Cambodia or get a Thai visa to go to the casinos. If you want to cross into Thailand, a Thai visa is required. Both Thai and Cambodian visas are available at the border. In Siem Reap Siem Reap the Chong Kao Sou station is located 7km west of town center. On arrival, tuk-tuks from the station into town run $3.00-$4.00 and taxis for $5.00. For departing passengers, most companies offer a free shuttle service to the bus. Distance, road and duration: National Route #6 and #5, 172 km, 3 hours. Road conditions: The roads are in very good condition. Transport notes: The ride follows NR 5 and 6 around the east end of the Tonle Sap lake, through Sisphon and some lovely rice paddy countryside. In addition to the buses listed bellow, there is also a daily ferry across the Tonle Sap Lake between Siem Reap and Battambang. Sihanoukville’s bus station is in the center of downtown. There are always tuk-tuks, motodups and taxis available. Transportation from the bus station tends to be more expensive than the usual transport prices. From the bus station, a tuk-tuk to Ochheuteal Beach runs $2-$3; to Victory Hill for $2-$3 and Otres Beach for about $4-$5. Within the downtown it shouldn’t cost more than $1-$1.50. Bus station: In Sihanoukville, all buses arrive/ depart from the Public Bus Station. Road condition: Excellent road conditions. One of the fastest national routes. Distance, road and duration: 110km, 1.5-2hrs., National Route Nº3 and Nº4. Transport notes: Though there are no buses plying the route between Kampot and Sihanoukville, there are regularly scheduled, multiple daily vans offered by a few different companies, Champa Mekong and Kampot Tours being the more popular. Most tour operators and guesthouses offer van tickets for about $4-$5, all from one of these few companies. The vans are of medium quality, a bit tight, usually a/c and take about 2 hours. (Taxis can make the run in about 1.5 hours.) 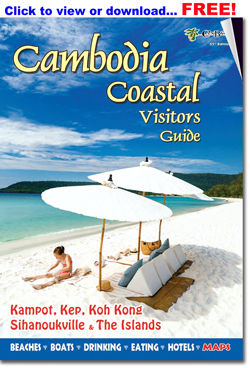 In Kampot or Kep check with your guesthouse or local tour operator. Road conditions: The road from Koh Kong (Road #48) is back in fair condition - fully paved in fair to good condition, but with a few short broken sections of potholes and road damage. Transport notes: Three companies offer daily a/c bus service between Koh Kong, Phnom Penh and Sihanoukville. In Koh Kong the bus offices are located on Street 3 in the center of town. The bus station is on Street 4 at the north end of town about a half kilometer from downtown. Kampot - In Kampot the buses arrive/depart the bus station on the east side of town about a half-kilometer off the riverfront. Kep - In Kep the buses arrive/depart at the Kep Beach intersection right at Kep Beach. Anna Tours offers daily direct buses between Phnom Penh and Kep. Distance, road and duration: National Route #3 (to Kampot), 148km. Transport notes: There are several regularly scheduled daily a/c buses between the cities, including deluxe buses from Giant Ibis. By bus the trip rarely takes more than 3-3.5 hours. 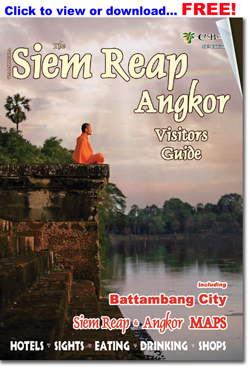 In Kampot it’s easiest to buy tickets from one of the many local tour and travel agents. Of the three or four bus companies run daily buses from Phnom Penh to Kampot, one Phnom Penh Sorya combines Kampot and Kep - the bus loops though both Kampot and Kep (which are about 30 minutes apart) - Kep first on the way from Phnom Penh and Kep second on the way to Phnom Penh. Distance, road and duration: National Route #3 and #33, 3hrs-4hrs. Transport notes: As there are more buses to Kampot, many people travel to Kampot first and then on to Kep by other means. Currently only Phnom Penh Sorya offers regularly scheduled buses to Kep from Phnom Penh - the same bus looping though both cities - Kep first on the way from Phnom Penh and Kep second on the way to Phnom Penh. More popular for direct travel to Kep, couple of companies offer vans, including Giant ibis and Champa Mekong. Road conditions: very good road, 1.5-2hrs. Road conditions: Mostly sealed and good condition. Some areas of construction near Phnom Penh but generally not impeding traffic. Transport notes: Several bus companies (including Mekong Express and Bayon VIP and Phnom Penh Sorya..) run multiple daily buses between Phnom Penh to Battambang. Buses depart hourly or so, first bus departs at 4:00AM and the last at 5:30PM. Fare: about US$7. The trip takes 5 hours. In Battambang, buses depart from the various transportation company offices. Phnom Penh Sorya Transport offers bus departing Phnom Penh every hour between 6:30AM - 4:00PM to the following destinations: Kampong Cham, Oudong, Kampong Chhnang, Tonle Bati, Takeo, Saang, Khou Thom, Chrey Thom, Neak Loung, Preah Vihear. General speak you can get off anywhere along the route. See Nearby Destinations for more on how to use these routes to explore some of the nearby ruins and historic sites. Distance, road and duration: National Route #5, 198 km, 3-4 hours. Visas: Cambodian visas are available at the border. Vietnamese visas are not available at the border. 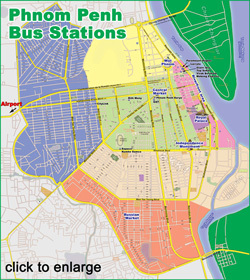 Bus Stations: In HCMC, most of the bus companies are based on or near Pham Ngu Lao Street (the traveler area), and in Phnom Penh several of the Vietnam bus companies are based on Sihanouk Blvd, near the Olympic Stadium. Transport notes: Nearly a dozen bus companies offer several daily direct buses between HCMC and Phnom Penh (Though you will disembark at the border to pass through immigration and customs.) With buses you tend to get what you pay for, with smaller cheaper buses tending to drag the trip out a bit longer. Most bus companies collect passports from passengers, which are then returned at the immigration station at the border. Passengers report that that Cambodian on-arrival visas obtained by the bus companies have a US$5 surcharge. The buses ordinary stop for a 30 minute rest break at a restaurant about 15 minutes from the border. Transport notes: Two options: 1) Change bus at border. Bus from Phnom Penh to Poipet, and; 2) direct bus from Phnom Penh to Bangkok (via Siem Reap) with no bus change at the border. Transport notes: Generally speaking there are three option: 1) Direct bus between Bangkok and Siem Reap; 2) Package bus ticket between Bangkok and Siem Reap, but change bus at border; 3) DIY with bus or taxi and maybe train. 1) Direct Bus (see schedule below): One ticket, one price, no bus change at the border, though you still disembark and walk through for visa, immigration and custom check. 2) Package Bus ticket: One ticket, one price, change at the border, though you still disembark at the border. In its favor, package bus tickets are cheaper than the direct bus and there are many more departures. Ticket run around $10-$17. 3) DIY: Coming from Bangkok, take a bus or train to Aranyaprathet. The bus takes about 4 hours and departs the Northern Bus Terminal (Morchit) hourly all day. 190-230B. From Aranyaprathet, take a moto or tuk-tuk to the border, and once on the Cambodian side take a shuttle to the transport station, where onward buses and taxis await. Transport notes: There are two bus routes from Sihanoukville to HCMC: 1) the fastest and most direct route, via the Phnom Penh and the Bavet Border Crossing; 2) Through Kampot to the Prek Chak border crossing. The following buses follow the #1 route. Most bus companies collect passports from passengers, which are then returned at the immigration station at the border. Passengers report that that Cambodian on-arrival visas obtained by the bus companies have a US$5 surcharge. Visas: Cambodian visas available at border. Vietnamese visas are not available at border. Bus Stations There is no centralized bus station in Phnom Penh. Buses from different companies depart from different stations. Some buses depart/arrive from the bus company office, others from remote bus stands such as market parking lots. One of the largest bus stations in Phnom Penh - Phnom Penh Sorya Transport - is next to Phsar Thmey (Central Market). Several bus company offices are also concentrated near Street 104 and Sisowath Quay on the riverfront. The rest are scattered around town. In most provincial cities, including Siem Reap and Sihanoukville, there is a centralized bus station from which all buses arrive and depart. In Siem Reap the Chong Kov Sou station is located 7km west of town center. On arrival, motodups from the station into town run $1.50-$2 and tuk-tuks for $3. For departing passengers, most companies offer a free shuttle service to the bus. In Sihanoukville, the bus station is located near the Independence Square, at least a couple of kilometers from most hotels and beaches. Motos run $1-$3 and tuk-tuks $4-$6 from the bus station to the town or beaches, depending on your destination. Bus companies The following list is not comprehensive but does include most of the major bus companies. Offering deluxe buses and mini buses from Phnom Penh to Siem Reap, Sihanoukville, Kampot, Ho Chi Minh and Bangkok including a night bus to Siem Reap. New, advanced design buses, seat belts, free wifi, snack, TV, guide. Giant Ibis has been receiving excellent reviews from customers for their comfort, safety and reliability. Vans and buses between Kep/Phnom Penh, and Kep/Sihanoukville. Full size a/c buses to destinations across Cambodia. Regular daily buses between HCMC and Phnom Penh. Deluxe mini-buses Phnom Penh to/from Siem Reap. Deluxe buses Phnom Penh to multiple destinations in Cambodia. Mey Hong Transport Co., Ltd.
Daily buses between Phnom Penh and HCMC.